Tourists from abroad are keen to see Australia's unique wildlife, especially the cute koalas. Before my first visit to Australia I read many travel guides, and I always wrote down recommendations where to spot koalas. Victoria, and the Grampians National Park was one of the places to go to see Koalas. 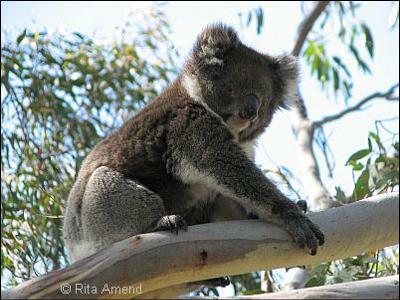 Okay, I was in the Grampians, got a stiff neck because of looking up the trees all the time, and I didn't see a koala. The other place was so remote, I've never been there. Of course I saw koalas in wildlife parks, but that's not the same than to discover them in the wild, right? Then my friends I always visit in Adelaide moved to a suburb in the Adelaide Hills. All I can tell you THIS is the place to go to see koalas! One day I even saw one walking along the roadside. The Adelaide Hills begin right on the edge of Adelaide. Luckily, although more and more areas in the hills were covered with houses, there are still many old gum trees left, the habitat for koalas. So if you ever visit Adelaide, spend some time in the hills. Walk around and have a close look up the trees. Join in and write your own page! It's easy to do. How? Simply click here to return to Readers' Stories - Adelaide.